How can I improve my portfolio? I want to improve my portfolio. This may seem like a no-brainer. Duh, who doesn't want an improved portfolio? The question is how, exactly. How can I make my portfolio more appealing to art buyers and art reps? 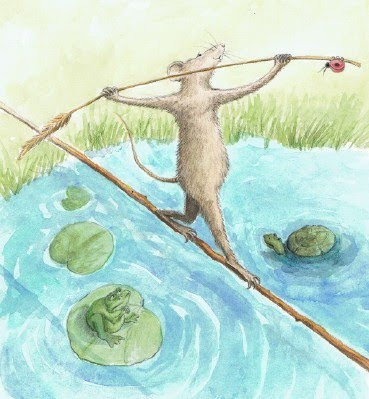 I read a very interesting article written by Christine Tugeau, an artists representative specializing in children's illustrators: What a Character! "But now, concentrating on character development, the artist should take that memorable image and show what has come before, or what will happen after, in another couple of images or vignettes. If art assigners only see one image they don't know for sure if the artist can produce that SAME character again. Will it look right in the next image with a new emotion and interaction? Will the artists be consistent and solid in their characterization, palette and story pacing? Are the artists able to be as strong in drawing, color, and composition beyond the one piece?" Here are two of the sketches I'm currently working on. They aren't finished sketches, more like "stop and pick up my youngest from kindergarten, eat lunch, back to school to bring penguin cupcakes for my other daughter's second grade class" in-progress sketches. 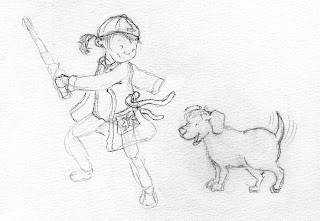 However, my plan for this week will be to draw this little tomboy and her pal in at least four or five different scenes. Both of my children posed in my husbands clumsy boots and I went with my sons pose because he's smaller and there was more topply drama. In the photo he had a huge smile and Nutella on his face, here he has on the "my mom is drawing attention to me embarrassment face". 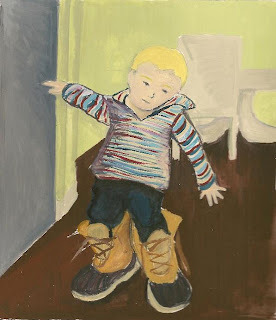 I think that in addition to the boots being the Illustration Friday prompt, clumsy, I think the painting itself is a little clumsy with odd arm angles and floaty furniture placement but I do like the face and boots so here it is. Sometimes life just feels like a balancing act! Trying to balance family, friends, jobs, home, and the other committments that fills one's life is a big challenge. Trying to balance the elements in my compositions is another kind of challenge on a lesser scale. Here's to a week of finding balance both large and small. 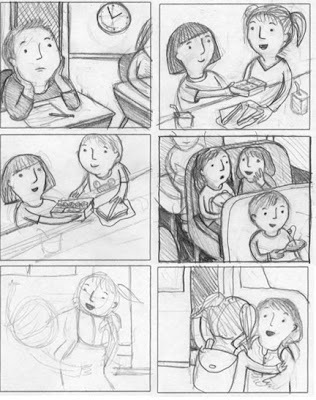 These are some sketches I did for a group postcard sent out in 2008. I think it's fun to share all the discarded ideas, and to ponder if you made the right choice for concepts. I actually wish I chose a few others before the one I ended up painting, seen below. Particularly the hug off the school bus. There's something about that one that gets me every time. I think I'm just a sucker for hugs! I've also changed my style so my kids have eyeballs rather than just dots. So many people do 'just dots' successfully but I don't think I was getting the most emotion out of my characters that way. I also used to 'paint' blush with photoshop, now that I'm better at painting, I just use gouache and it looks much more natural. As usual, here I come straggling in late. Only this time it's with my post. Sorry everyone! Better late than never, non? 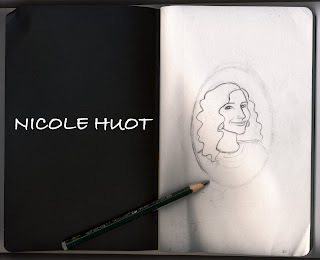 I'm Nicole Huot and like all of the other talented ladies in our group, I'm also an illustrator. I received my BFA in illustration back in 2000. A decade later I find myself working on a second degree...only this one is in graphic design. I absolutely love learning new things, but being in school in addition to holding down a job and maintaining a household really takes its toll. My little Etsy shop where I sell my illustrations has been a bit neglected, my art desk is collecting dust, and I haven't been able to attend a meeting with any of my fellow bloggers in quite some time. However, it is a new year, and that signals a fresh start. (Or at least the good intentions to begin anew, right?) I'll be graduating from my program in almost exactly one year. In the meantime, I'm hoping to balance all the crazy aspects of my life and make time to do what I love - drawing and painting! This blog will be a good (and much needed) nudge in that direction. She likes to tango and spend time at the spa. She is a chef. Hi Everyone! My name is Vita Mechachonis, and yes I too am an illustrator! I live in Portsmouth, NH, and I love it here on the seacoast. I like walking out my door and smelling the deliciously salty sea air. I love freshly baked carob brownies, and avacados - but not together. I'm addicted to yoga, and I have freckles and fair skin. I have the most perfect well-behaved loyal mutt in the world, and two beautiful nieces, who even though are just babies, already have me wrapped around their little fingers. I'm really into listening to books on cd while I work, or pandora.com, since my stereo at home is the same one I got for my 18th birthday, and doesn't get the greatest reception. 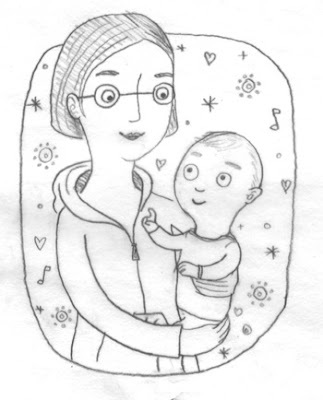 One of my goals for the somewhat near-future is to illustrate a children's book - though really I'm thinking a little older...maybe a chapter book would be a good place to start. I have a wonderful agent who gets me work, and also helps me license out my art to manufacturers of any and everything... paper goods, apparel, fabric, etc. I am so happy Smells Like Crayons is on the web, and to be in such a wonderful group with such inspirational women. I'm really excited that the "Smells Like Crayons" blog is up and running. Yahoooooo and Heeeee Hawwww!!! This is a wonderful group to be a part of, and I'm really glad that I can call these talented women my friends. My name is Michelle Henninger. I live in Nashua, NH, and I love to draw. Ask my kids. Ask my husband. Ask my dog. I always have a pencil in my hand. I adore the work of R.W. 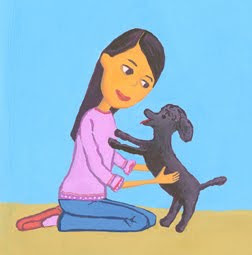 Alley, and Marla Frazee. They have an amazing way of capturing gesture and expression in the simplest of lines. They are amazing! "I'm not worthy, I'm not worthy!" 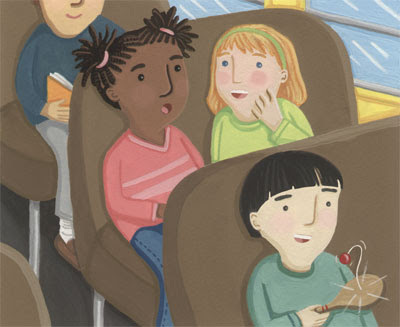 I won the NESCBWI 2009 Ann Barrow Illustrator scholarship, I've been a regular contributor to Stories for Children Magazine, and my work has been seen in the SCBWI Bulletin from time to time. What else can I tell you about myself, hmmmm.... I love SmartWool (I'm always cold), Oreo cookies are my guilty pleasure (I never dunk them in milk though.... bleuch), Stick It and Chocolat are tied for my favorite movie, I can't live without my cuppa(s) (PG Tips only, thank you very much!) and did I mention that I love to draw? It's exciting to open the new year with a new blog, even if the same old desk is still covered with the same old clutter. 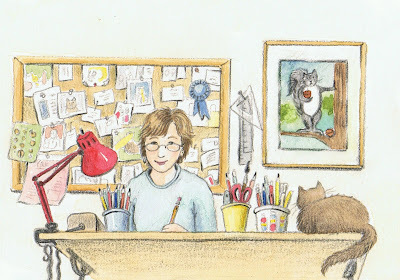 My name is Jane Tentas and I've been a member of this group and the SCBWI since 2004. 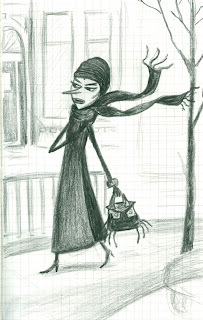 My primary career is teaching art to high school students, but I've always had an interest in writing and illustrating. As a child, I enjoyed drawing pictures for my own stories (usually about pioneers), but what I really wanted, was to be Laura Ingalls Wilder. The illustrations, in the "Little House" books, drawn by Garth Williams are still my favorites. My continued fascination with the "olden days" led me to collect stories from my grandmother about her childhood on Block Island, which happily did turn into a children's book. I am looking forward to collaborating in this new venture with a great group of illustrators who help keep me accountable to my goals. I was long overdue for a fresh self-portrait, and what better time to do so than kicking off a shiny-new blog! I thought it also fit really well with this week's IF theme, Renewal. 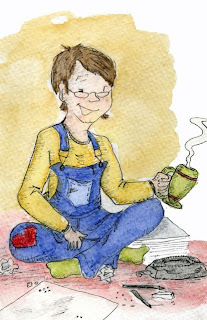 My name is Gina Perry and I work as an illustrator from my home in New Hampshire. 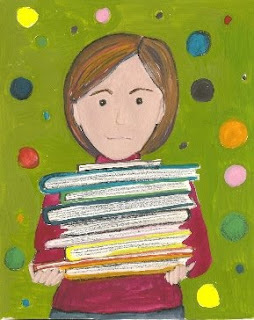 I'm learning to balance work and life (on one hip, see above!) 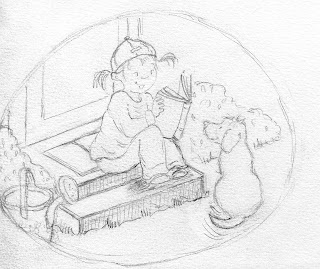 and hope to someday be a published author/illustrator of children's books. I've had a lot of interesting detours along the way to this career, but I finally feel like I'm on track. That doesn't make the journey any easier and the women in this group have been my beacons since 2002. Now that we're online as a group I hope we can, in our own unique voices, be a support to fellow illustrators. So hello 2010, and hello Smells Like Crayons! I live in Nashua, NH. I grew up in Watertown and Waltham, MA just outside of Boston. My husband, son, daughter, and poodle have all appeared in my work. I stay inspired by looking at art and design blogs; reading; visiting museums and galleries; observing animals and people; listening to music; and being around other artists. Chinatsu Ban is one of my favorite contemporary artists. Illustrators that inspire me include Juliette Borda, Maira Kalman, and Giselle Potter, but there are LOTS of others. Gouache is my medium of choice for illustration. The Velveteen Rabbit is one of my favorite children's stories. It is about being real and it makes me cry. I am addicted to Project Runway. It is about creating under pressure. Ok...sometimes it makes me cry, too. 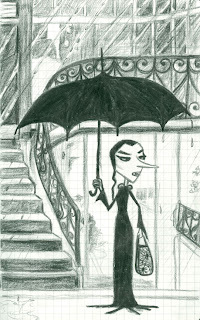 My first career was teaching art and I didn't seriously consider a career in illustration until a few years ago. I decided my ideal life would be working as an illustrator/designer and teaching as a visiting artist part time. So that is the life I'm creating. Some other things I like to do are bake biscotti, take step and kickbox classes, work in my gardens, spend time with family and friends, and visit cities where the Red Sox play.